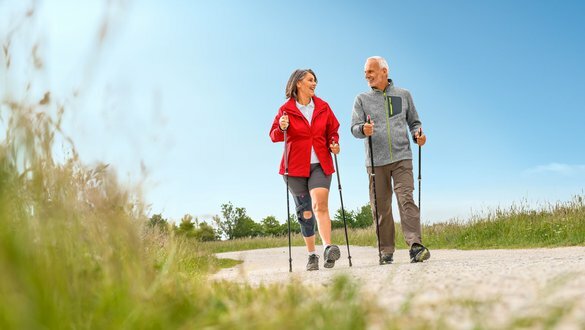 In many cases, supports and orthotic medical devices are used in parallel with pharmacological and surgical treatment and physiotherapy to treat osteoarthritis of the knee. Supports have the advantage that they are easy to use, which is particularly important for older patients. The stocking-shaped elastic material is easy to pull over the limb and gives the patient a feeling of support. This feeling is created by the compressive properties of the elastic material; the supports do not have an external immobilising function. External temperature control is another mechanism of action of so-called osteoarthritis supports. Patients with advanced osteoarthritis report that cold temperatures aggravate their symptoms, particularly damp cold. A support can offer reliable protection here, especially during cold weather. The use of orthoses has proved particularly useful for advanced osteoarthritis of the knee because the affected compartment (usually medial) is relieved and stabilised in the long term. for patients with osteoarthritis of the knee, who cannot have an operation because of their age or for other medical reasons. Of course an orthosis can also be used in combination with other treatment options to provide support, because wearing an orthosis alone certainly cannot relieve all the symptoms of osteoarthritis. So-called osteoarthritis (OA) splints have also proved their worth after surgery on the joint cartilage or meniscus refixation. Click here for more information about medi's supports and orthoses.